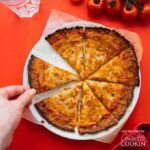 Cauliflower Pizza Crust: cheesy, tasty low carb pizza! This Cauliflower Pizza Crust is deliciously cheesy and sturdy enough to pile it with toppings! 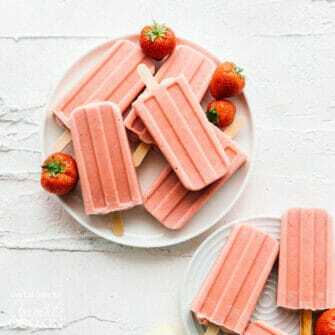 Perfect for the low carb lovers. If you can’t tell, we’ve been on a bit of a low carb kick recently (see our Cauliflower General Tso’s and Cauliflower Garlic Chicken). We only eat cauliflower around here, no need for any other food in your life, friends (jk, you should obviously eat other foods too). In need of topping ideas? Try out this 3 Cheese Roasted Grape Pizza, or this Beer and Brussels Sprouts Pizza, or this Appetizer Veggie Pizza! 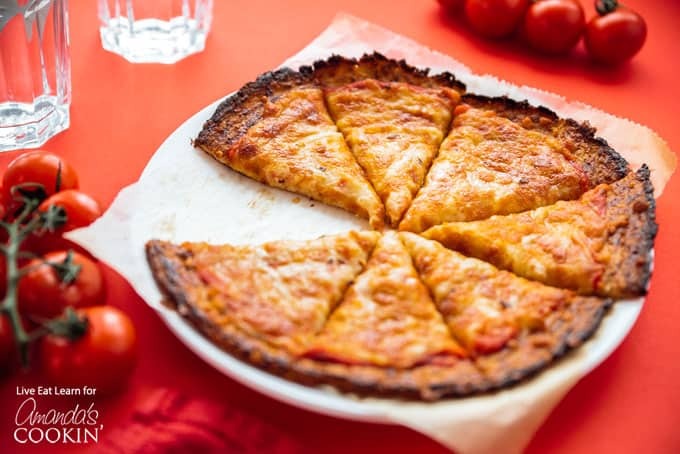 So the secret to the perfect Cauliflower Pizza Crust? 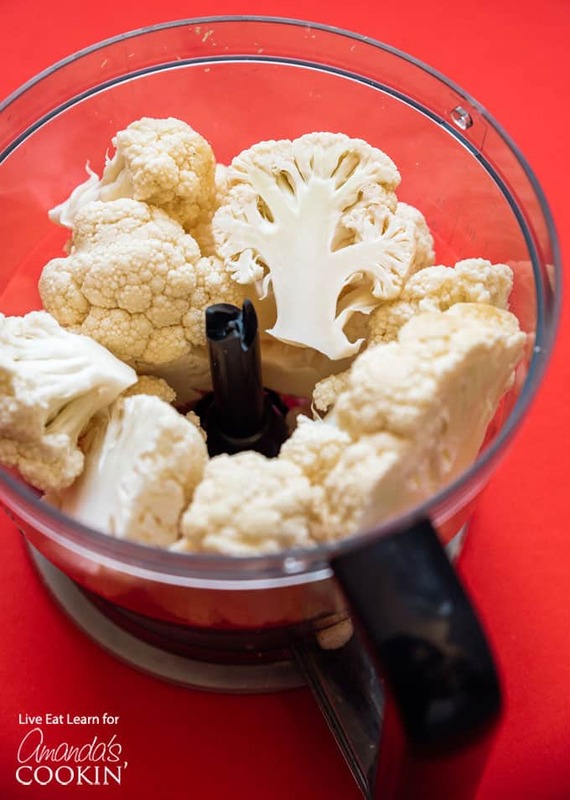 Dry out the cauliflower as much as possible! 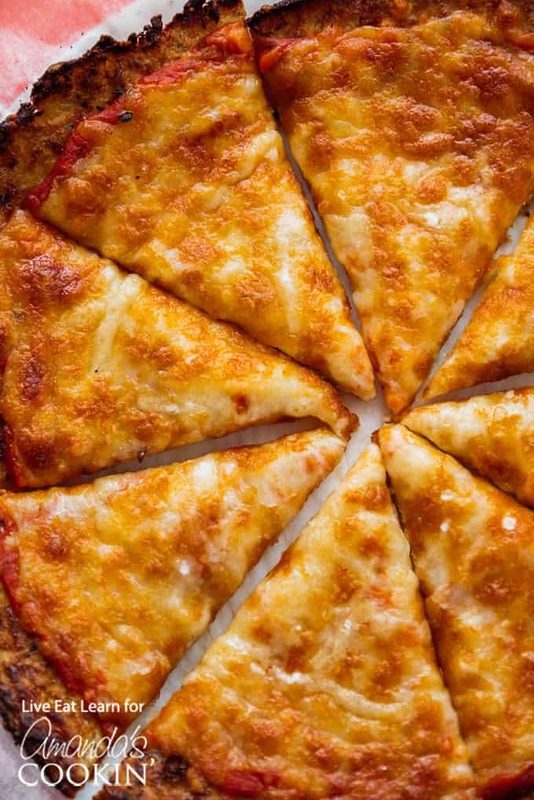 Cauliflower has a surprising amount of moisture in it, which is bad news for pizza crust. Too much moisture will cause the crust to be soggy and weak. To dry out our cauliflower we’ll do two simple things. First, roast it! Grate up your cauliflower into rice consistency then roast it to start drying it out. Then we’ll transfer it to a cheesecloth and wring out as much moisture as possible (we’re talking full arm workout, possibly sweating from squeezing the water out of this. 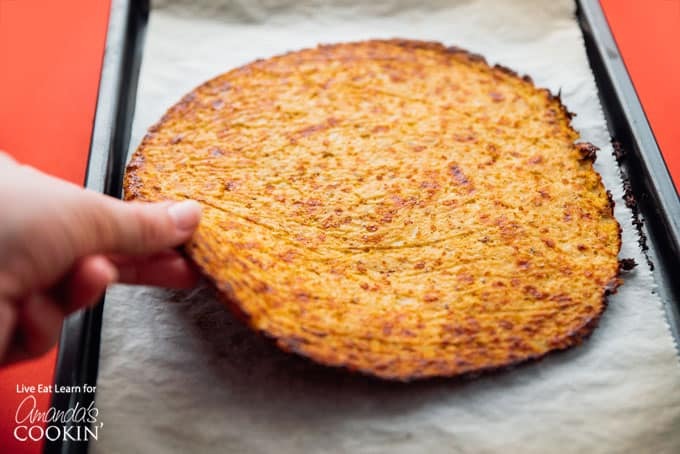 What you’ll be left with is relatively dry cauliflower pulp of sorts that will become the foundation of your cauliflower crust! Then you’ll just mix in your eggs, cheese, and seasonings, shape into a pizza crust and prebake to set the bottom. Top with your favorite toppings, return to the oven to finish cooking, then dig in! More of our recent cauliflower recipes include this Cauliflower Risotto and Cauliflower Fried Rice, cauliflower is so versatile and makes a delicious alternative to a lot of high carb foods we all know and love. 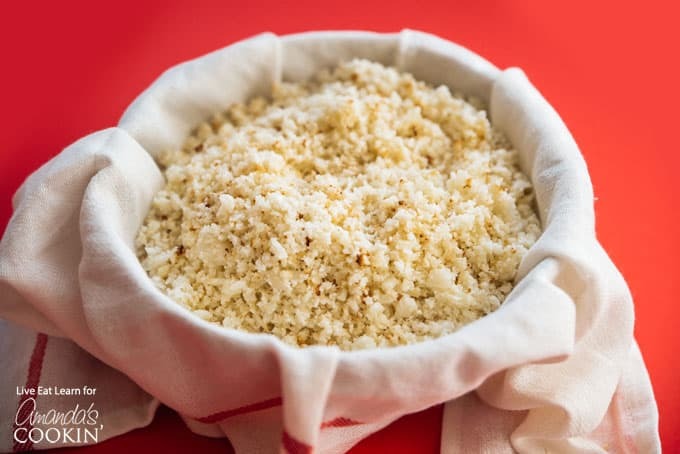 Grate cauliflower into rice consistency using either your food processor or a box grater. Preheat oven to 350 degrees F. Spread cauliflower onto a parchment-lined baking sheet into as flat of a layer as possible. Bake for 20 minutes, or until the cauliflower begins to brown. Remove from oven and let cool slightly. Increase oven temperature to 450 degrees F.
Spoon cauliflower into a cheesecloth and squeeze out as much moisture as possible. In a large bowl, stir to combine cauliflower and all remaining ingredients. Shape dough into a pizza round on a parchment-lined baking sheet. Bake for 15 minutes, carefully flipping the pizza crust halfway through cooking*. Top pizza crust with your favorite sauces and toppings, then return to the oven until all melty and delicious, about 7 minutes. *A trick to make flipping the crust easier: Set another parchment paper on top of the dough, and a large plate on top of that (if this were a sandwich, the baking sheet and plate would be the bread, and the pizza crust would be the filling!). Flip the “sandwich” all at once then simply slide the pizza crust onto the baking sheet.